I'm starting a new TAG! I want to hear about everyone's favorite baby/child-related things they've picked up in their mothering adventures! So I will start it out, then everyone else do it, too! ;) Scroll over the first words of every item -- the big, bold ones -- for the link to that product! People keep asking me where I got things, so here ya go! 1. 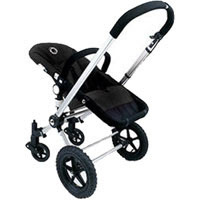 Bugaboo Frog stroller -- I seriously can't say enough about this stroller! It's a little pricey, but SO worth it! I got mine used on Ebay for about 1/2 the price, and it's been wonderful! It has a bassinet attachment for before they're able to sit up, an attachment for my Graco car seat (MUCH lighter, smaller and easier to maneuver than a travel system), and a regular seat (that you can tip at different angles, so I can lay him back if he falls asleep). Steve's favorite part is the shocks on the wheels -- we have taken it off the trails in the mountains and been fine! You can also take it in the snow and sand (if we had any around here!). And it handles like a dream! ;) It turns on a dime and I can push it through a crowd with one hand! And pick it up with one hand! Wonderful wonderful bugaboo!! I love you! 3. Sweet Ruby binki clips -- a good friend of the family, April Maw, makes these clips, and the only time Grayson isn't wearing one is in the bath tub!! I have 3 different designs (because you have to match his cute outfits! ), and I want more! They're stylish and practical, and they don't have the huge plastic clips that are so bulky! And I don't ever have to deal with a binki dropped on a public bathroom floor!!! She makes attachments for all different kinds of binki's, too! She also makes cute hooded towels, adorable onesies, and the cutest, softest lovey blankets (we have all of these, too -- love it all! Gray can't sleep without his blankie!) Thanks, April! You're a genius! 5. Lilypadz are the best nursing pads I've found! 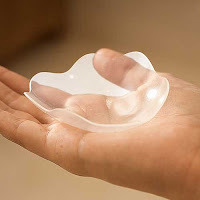 They're very thin and stick to your skin to prevent leaking, so you don't have to walk around with soaking wet pads that are super thick and show through your shirts! And they're reusable -- just wash with soap and water -- so you don't have to keep buying lots of pads! 6. 4Moms Baby bath tub -- I loved this tub -- I'm sad that Gray has outgrown it! It's great because it has a built-in thermometer so you know instantly if the water is too hot, a separate basin for the water to go in before it runs down to the baby so if it DOES get too hot, it doesn't touch the baby, AND it uses constantly-running water, so the baby is never in dirty water! And it fits on just about any sink, so it's right at the most convenient height. Love it! Thanks again, Mom for finding this, too! 7. 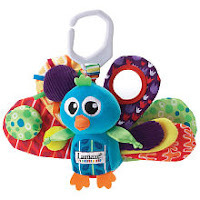 Jaques the Peacock by Lamaze -- baby Gray's favorite toy! It has cool black and white patterns on the back, which he loved when he was a tiny baby. And it has fun colors, textures and sounds that he loves now! His first smile was at this toy!!! What a cool stroller. So cute and don't you just love ebay? And thanks for the shout out. I really couldn't have lived without Ruby having her binky clip, especially when she started walking. Now unfortunately she no longer uses it because she can only have a binky at night, I guess its a good thing I'm having another one. Okay! Where did you buy the Lilly pads? I need something different for sure! I absolutley hate the pads I have and have tried two different kinds now, and cannot stand them! Also, My mom made me a nursing cover, (booby bibs)! She is selling them now, so if you know anyone who wants one she sells them for $25. I really love it too! It has the wire so you can see the baby and also a pocket made of terrycloth to wipe away spit up and store things in! It really has helped me out!!! I just ordered some Lily Padz to try for the first time. Have heard great things! !